Hollywood Beauty's hydrating hair mask enriched with Argan oil from Morocco is ideal for hair that is dehydrated, severely damaged and/or chemically treated. 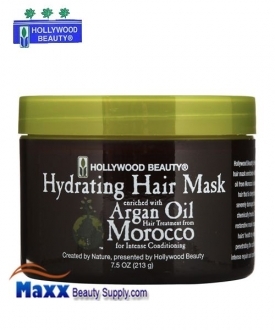 This restorative mask improves hairs health by deeply penetrating the cuticle for intense repair and conditioning. Just for you: Dehydrated, severely damaged and/or chemically treated hair. After shampooing, apply a small amount to wet hair and massage through from roots to end. Leave on 5 to 10 minutes. Rinse thoroughly. Use once a week or as often as needed, depending on severity of hair damage. Water (Aqua), Cyclopentasiloxane, Behentrimonium Methosulfate, Cetearyl Alcohol, Behentrimonium Chloride, Argania Spinosa Kernel Oil, Glyceryl Stearate, PEG-100 Stearate, Cetyl Alcohol, Glycine Soja (Soybean) Oil, Stearic Acid, Dimethicone, Cetrimonium Chloride, Triethnaolamine, Ribes Nigrum (Black Currant) Fruit Extract, Vanilla Planifolia Fruit Extract, Fragrance (Parfum), Methylparaben, Propylparaben, Disodium EDTA, FD&C Yellow No.5, D&C Red No. 33, FD&C Blue No. 1.